Today we’re going to look at a few places where you can shop ‘til you drop, get yourself a new wardrobe, find a new avatar, and deck yourself out in some fine jewelry—all without spending a dime! (Or even a $Linden.) Sounds too good to be true? HEY! WAKE UP! This is Second Life! If you can imagine it, you can do it! The Free Dove is one of SL’s oldest purveyors of quality freebies. Located in the Gallii region, it should be one of your first stops when you go shopping. Serious shopping. Paloma has partnered with some of SL’s finest fashion designers to bring you samples of their works. And whether you have a standard avatar or one of the new mesh avatars, you’ll find a wide variety of items to fill your shopping cart. Did you know that your standard SL avatar can wear mesh clothing? Many of the Free Dove’s items will work just fine on you. Whether it’s clothing, shoes, jewelry, or makeup, check out the selection at the Free Dove. And check back often—Paloma frequently updates her inventory, so if you see something you like, be sure to grab it. It might not be there on your next visit! New Resident Island, or NRI, also offers free “shopping.” I put shopping in quotes because while you do have to buy their items, all of the prices are $L0; that is, free. But besides shopping, NRI also offers tutorials where you can brush up on your basic SL skills. In addition, you can watch movies or learn how to build things. They even offer a variety of free building items. And in addition to clothing and fashions, you can even pick up a new avatar, complete with wardrobe and animation over-rider. So if it’s clothing you need, a refresher course, or miscellaneous objects you’re looking for, hop on over to New Resident Island and look around. NCI Kuula, to be exact. A very popular spot for building, learning, and just plain socializing. 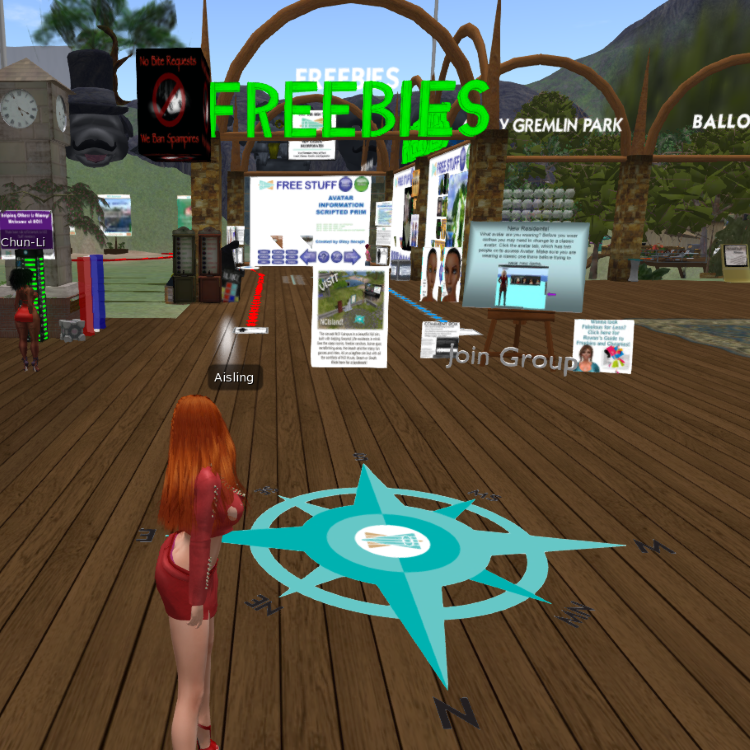 Enjoy a balloon ride for an aerial view of the region, explore the extensive selection of freebies, make new friends—it’s all designed for the new SL resident. While it’s always exciting to explore SL, these are a few excellent places to start.